The major disturbances of the Alaskan boreal forest include wildfire, flooding, insect and pathogen outbreaks, permafrost thaw, and drying of lakes and streams. These disturbances impact ecosystem function directly through the changes they impose on the physical environment, and indirectly through their effects on vegetation. The nature of disturbance strongly influences the pattern of plant succession and the types of vegetation, which, in turn, feeds back and influence the disturbance regime. The frequency of disturbances is affected by climate and with warming have become more frequent and extensive than at any point in recorded history, and will likely result in substantial changes in the structure and functioning of the Alaskan boreal forest and its role in the global climate system. Fire is a pervasive disturbance across the boreal forest and major structuring force controlling the types and distribution of vegetation. Over the past 40 years, the area burned each summer in the boreal forest has increased nearly four-fold. Average annual area burned in the boreal forest of Alaska from 1940 - 2010 (from Kasischke et al. 2010. Canadian Journal of Forest Research). Warm, dry weather allows fires to continue burning in late summer, when soils are deeply thawed, have lower soil moisture, and therefore burn more deeply, creating a radically different environment for seedling establishment of mineral soil seedbeds. The increase in mineral soil seedbeds as well as a shortened fire interval promotes the establishment and dominance of deciduous trees rather than evergreen trees. The increase in fire frequency, area, and severity, therefore suggests potential shifts in the relative abundance of forest types that currently dominate the Alaskan boreal forest: a decline in abundance of black spruce, which has dominated the lowland landscape and north-facing slopes for the last 6,000 years, a potential increase of deciduous forests in former black spruce habitat, and a conversion to grass or shrublands on dry sites. Insect and pathogen outbreaks are characteristic of the North American boreal forest and in recent decades have caused widespread mortality and damage in interior Alaska. Many of the dominant tree and shrub species the Alaskan boreal forest are susceptible to drought stress, which is expected to intensify with climate warming and further increase plant vulnerability to insect and disease damage. Additionally, biological invasions of non-native insect species, possibly including larch sawfly and amber-marked birch leaf miner, have affected large areas of the Alaskan boreal forest. Recent outbreaks of a fungal stem canker ( Valsa melanodiscus) are causing widespread dieback and mortality of thinleaf alder (Alnus tenuifolia) throughout central and southcentral Alaska, causing significant declines in ecosystem nitrogen inputs derived from N-fixation. Thinleaf alder plays a fundamental role in influencing ecosystem processes and community dynamics, and the long-term impacts of the canker on biogeochemistry and successional dynamics will depend on whether alder populations recover from the current epidemic. Longer summers and higher temperatures are causing drier conditions, even in the absence of strong trends in precipitation. For example, white spruce forests in Alaska’s interior are experiencing declining growth due to drought stress and continued warming could lead to widespread death of trees. Five year running average of tree ring width, d13C discrimination, and x-ray attenuation (from Barber et al. 2000. Nature). Collectively, increased insect and disease outbreaks, reduced photosynthesis and growth, and change in plant carbon allocation have led to a “browning of interior Alaska” as measured by satellite-detected trends in normalized difference vegetation index over the past several decades (Verbyla 2008). With warming and loss of permafrost, watershed hydrology is changing with stream flows becoming less flashy and increasing flow during the winter. Another consequence of warmer, drier summers is the reduction in surface water, and associated shrinkage/disappearance of closed-basin ponds throughout the Alaskan boreal region as a result of increased evaporation and boreal-forest/permafrost thaw. 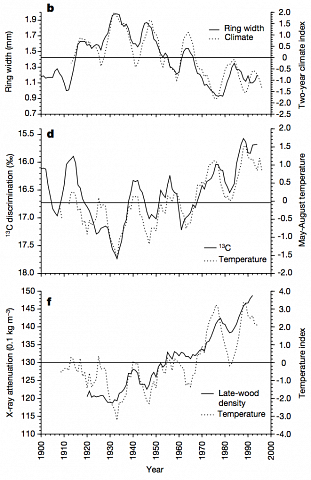 Decline in area of two lakes of the boreal forest from 1951 to 2000 (Riordan et al. 2006. Journal of Geophysical Research).